In this series I tell the story of honeybees and their critical challenges through their own gift to us: beeswax. Using the ancient technique of encaustic I transform organic materials of beeswax, tree resin and pigments into sensual, luminous, meditative works. The creative process is an alchemical dance requiring utmost focus. Heat is used at every stage, fusing each brushstroke to the next. Mystical is the quality of luminescence that emits from encaustic paintings. They are illuminated from within, for as light passes through the layers of wax it is reflected back up to the surface. As an environmental artist, my work speaks in reverence of the natural world. 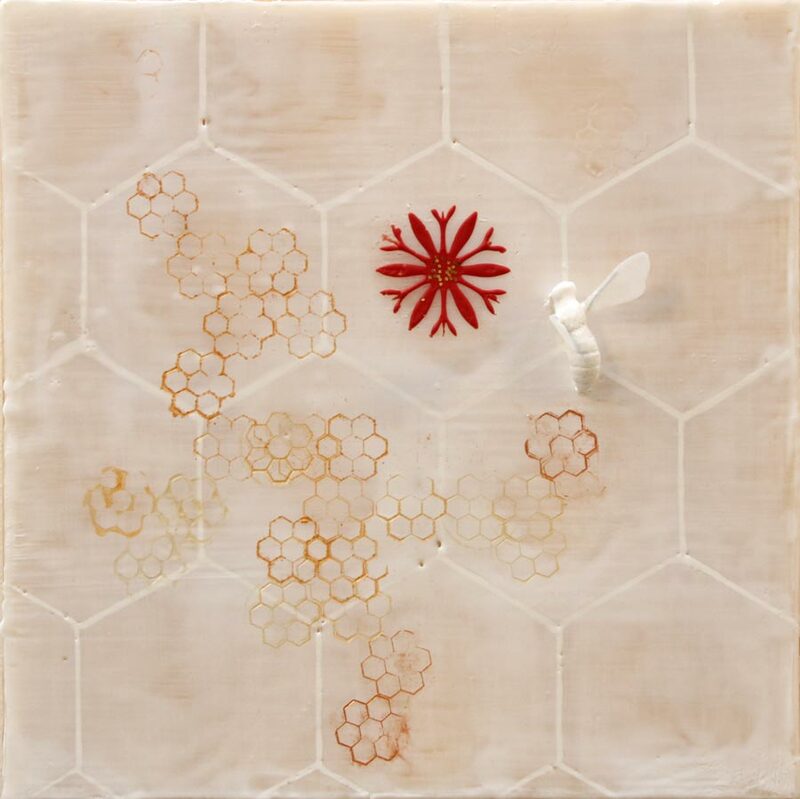 This series thus pays homage to the sacred honey bee, which has many mystical qualities, including its ability to alchemically transform flower nectar into beeswax. The paintings seen here offer small, luminous, meditative mandalas that draw inspiration from the hive and pollination as well as from color and image symbolism and from sacred geometry. The series evokes the nature of golden bees as vibrant, joyful, full of life and nurturing creatures; gold also represents sunlight and the golden thread that bees weave from flower to flower. Pinks and greens resonate with the heart chakra and represent a call for compassion, for while bees are depicted in this series in the vibrant colors of life they are also depicted in the monochrome of death: sculpted white bee spirits accompany the works along with black forms representing the dark toxic seeds of industrial farming. The white bees and black seeds together speak the language of winter, of the dying that occurs in the coldest season. And they beg the question: will Spring come again for the bees?